If it’s time to rent a self-storage unit, it can be difficult to decide which unit is best for you. There are many options available whether you have to store a vehicle, have a collection of antiques you want to keep safe and dry, or are planning a move and need a temporary place to store some boxes. Renting the right self-storage unit for your needs is important as it will ensure you have the right amount of space while keeping your spending down. You also have to consider what you are storing make sure you have the best climate to protect your items from any damage. With various sizes available, your local facility can recommend the best solution, whether that’s indoor or outdoor, climate controlled, or a premium unit. 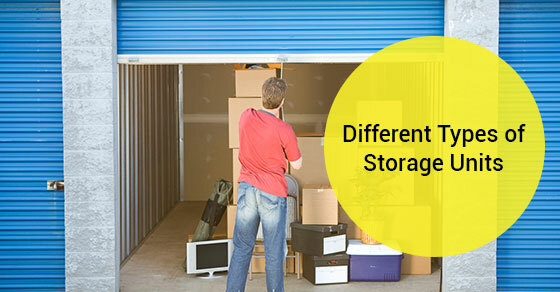 Here’s some info about the different types of storage units available to help you get started. Some people need long-term rentals, while others need a day or two. Determining the duration of your rental will help you sort the types of units available. Although most are available for both long and short-term rentals, it is always best to have a good idea of how long you will be storing your items. If you are uncertain, look for services that do not tie you into a contract for a specific amount of time. You will want to have the right size storage unit for your needs. You will also have to consider what you are storing and if you are going to want to continue to add to your unit. Although you can certainly choose to upgrade to a larger unit should the need arise, this is a hassle as you’ll have to move everything. Instead, it is best to think what unit will suit you best in the long-term. Will you have multiple items such as boxes and furniture, or are you just looking to store specific items without any additions? Estimating on the higher side will make it easier to fit everything into the unit. We offer advice based on what you will be storing to help you make the right decision. You also need to consider access. If you rent a unit that is the perfect size to squeeze everything in, your items will become very difficult to access. That is why it is always best to think big so you can have a handy aisle in the middle of your locker for easy access without having to drag everything out to get to items at the back. It also allows you to see everything in your locker. If you have no intention of accessing your items and just need straight up storage, then you can go smaller to save money in the long term. Mini units as small as 5’ x 5’ x 5’ are affordable options if you have a specific number of items to store and won’t really need to access anything until you come to take it all away. Indoor storage is located inside a storage building with several security measures in place to ensure only those with units are allowed to enter. There are various unit sizes available, from smaller, narrow units to larger room size units. Equipment will be available to help you get your belongings from your vehicle to your unit and elevators are available for any upper floors. The obvious benefit of an indoor unit is that your unit is protected from the elements and your belongings are out of sight from prying eyes looking for an opportunity for theft. Climate control is always a good thing, as it protects your belongings from shifts in temperature. These shifts can lead to moisture issues and also cause warping of your wooden furniture due to expansion and contraction. With climate control, you will reduce the risk of damage to your goods both from expansion and contraction and moisture caused by humidity. Humidity causes damage not only to wood, but also metal which can rust, any fabric — which can grow mould and damage — electronics and other tools or equipment. Even your documents, art and books can be damaged by humidity. Climate and humidity control are very important if you are storing your items over a long period of time to avoid rust, mildew and mould. Despite these issues, they can be a good solution for temporary warehousing for a renovation or while you are waiting to make a move. You won’t have the worries of damage and as long as your unit doesn’t leak, your belongings can be safe for the short time you store them. If you have valuables that require storage such as fine art and antiques, you will want to ensure you have a premium storage unit that takes the special needs of delicate items into consideration. As already mentioned, climate control is very important to protect your precious art and heirlooms from warping, mould and mildew. You might also want increased security features such as individual alarms for your unit. Individual alarms provide an added security measure, as although other renters can enter the facility, they will set off an alarm if they try to access your unit. You are provided with a unique code that grants access to your unit alone. For more information about the different types of storage units, call Jiffy Self-Storage at 416-745-4339 or contact us here.